Last week I attended a fabulous tea tasting workshop led by Mike Harney (of Harney & Sons Teas) at the International Culinary Center (ICC) in SoHo. Fourteen teas were served -- two whites, four greens, three oolongs, and four blacks -- and I will devote a post to each type of tea. 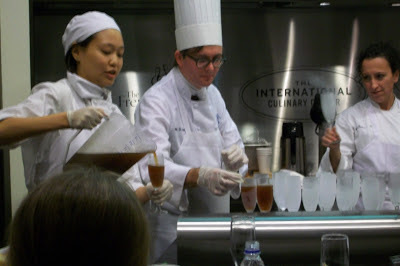 This first post of the series is about the tea cocktail which was served at the end of the tasting. Composed of pu-erh, lemon, agave sugar, and bourbon, it was the most unusual use of tea I've encountered. 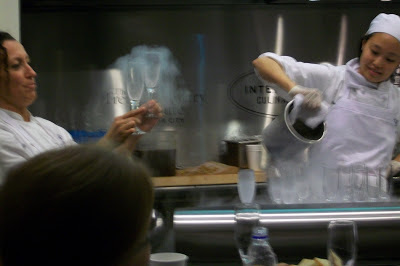 The cocktail was premixed and served in flutes chilled by liquid nitrogen. My sip tasted too strongly of bourbon, but I fondly remembered the Yunnan pu-erh served in Tasting 3 4: Black Teas. Are we talking something like a 'hot toddy' with a cup of pu'er, or just a splash of tea? Hot? Cold? Hello "Anonymous". Thank you for your comment. I do not recall that proportions were given but the cocktail tasted mostly like bourbon... If you get the recipe from Mr. Harney, please share it with us. what an amazing event! I love to learn new ways to steep tea outside the cup and into a meal or cocktail.